California Chrome Outduels Dortmund in Memorable San Diego Handicap: In a memorable renewal of the Grade II $200,000 San Diego Handicap, fan favorite California Chrome outfinished a stubborn Dortmund after a prolonged duel to score a half-length victory Saturday in the mile and one-sixteenth prep for the Grade I $1 million TVG Pacific Classic on August 20. California Chrome and jockey Victor Espinoza, outside, hold off a persistant Dortmund (Gary Stevens up), to win the Grade II $200,000 San Diego Handicap Saturday, July 23, 2016 at the Del Mar Thoroughbred Club, Del Mar, CA. 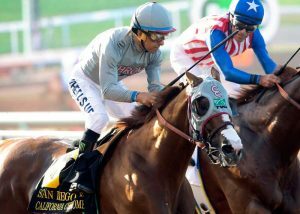 Dortmund, piloted by Gary Stevens, went to the front shortly after the break, but was hounded by California Chrome and jockey Victor Espinoza, who never allowed their rival to take a breather. California Chrome, the 2014 Horse of the Year and the all-time richest horse in North American racing history with earnings of more than $12.5 million, engaged Dortmund on the far turn, took a narrow lead entering the stretch and never relented while holding Dortmund safe under intermittent urging by Espinoza. California Chrome, the California-bred son of Lucky Pulpit owned by California Chrome LLC and trained by Art Sherman, was making his first start since winning the world’s most lucrative race, the $10 million World Cup in Dubai March 26. California Chrome, packing highweight of 126 pounds, went postward at 4-5, while Dortmund, packing 121 pounds, was 13-10 in his first race since winning the Native Diver last November at Del Mar. Win the Space was third, seven and one-quarter lengths behind Dortmund and nine and one-half lengths ahead of fourth-place Follow Me Crev in the field of five horses. Withdrawn from the original line-up were Hard Aces and Soi Phet. California Chrome ran the distance in 1:40.84 and returned $3.60, $2.20 and $2.10. Dortmund paid $2.40 and $2.10, while Win the Space returned $2.10 to show. Because of heavy wagering on the winner to show, there was a minus pool of $86,339. In the afternoon’s supporting feature, the $201,725 San Clemente Handicap for three-year-old fillies, Mokat and jockey Kent Desormeaux collaborated to score a decisive victory, by almost four lengths, in 1:35.23 for the mile over the infield Jimmy Durante Turf Course. Desormeaux took advantage of an opening entering the stretch to send Mokat to the lead with a burst of speed and the daughter of Uncle Mo proved clearly best in the field of ten fillies. Longshot Lady Valeur held on well to be second, three-quarters of a length in front of Stays in Vegas, with 5-2 favorite Be Mine fourth. Sweet Queen was withdrawn. The victory was Mokat’s second in nine starts and first money of $120,000 increased her earnings to $285,040. There were no perfect tickets in Saturday’s Pick Six so Sunday’s program will have a carryover of $157,938. Post time for the first race is 2 p.m.